RENO, Nevada – February 29, 2016 – Keeping endurance riders away from their equines for a weekend isn’t easy, but the annual gathering of the American Endurance Ride Conference gives them an opportunity to celebrate their riding accomplishments, learn more about the sport, and share input for the future of endurance riding. The 2016 AERC convention held in mid-February in Reno, Nevada —“the best convention I have been to,” according to one board member, culminated in the national awards banquet, where longtime ride manager Ann Nicholson was named as the 2015 Hall of Fame person. The newest Hall of Fame horse is LV Integrity, a 22-year-old Arabian gelding (AHR*498744) owned by Joyce Sousa of Hydesville, Calif.,). Endurance riding is often a family affair, and Ann’s mother, Lavonne Booth, was inducted into the nonprofit organization’s Hall of Fame exactly 20 years before. The Pard’ners award, which honors a rider/equine partnership that exemplifies friendship, enthusiasm and sportsmanship, went to local rider Gina Hall and Fire Mt. Destiny, an 18-year-old Arabian cross gelding (AHR*3A325818). They have competed together since 2002, racking up 7,300 endurance miles—124 rides with only two non-completions. Their partnership was rocky at first—“he was really scary,” said Hall—but now Destiny is a trusty companion and an “awesome babysitter” for horses new to endurance. Also honored were Buck and Donna Shrader of Pennsylvania who have volunteered at Northeast Region rides for decades and recently announced their “retirement” from pulse-taking, timing and other assorted volunteer duties. Riders will no longer anticipate Buck’s call at the start of rides: “Good luck, have fun and be careful!” The volunteer award gives them a great send-off and thank you for their dedication. Dot Wiggins, who has been involved with endurance riding and trails building and maintenance since the 1970s, is the recipient of the 2015 Ann Parr Trails Preservation Award. In Idaho, Wiggins has worked with the Forest Service, BLM and private land owners to preserve equestrian trails, most notably working from start to finish on the 84-mile Weiser River Trail, one of the few rail trails owned and managed by a nonprofit organization, the Friends of the Weiser River Trail, Inc.
Convention-goers had two full days of seminars ranging from horse health to rider health to online equine myths presented by nationally-renowned speakers, as well as a lively trade show with more than 40 exhibitors. Special guests at the convention included FEI Endurance Director Manuel Bandeira de Mello of Portugal and Australian veterinarian Brian Sheahan, chair of FEI’s Endurance Technical Committee. The two, along with other United States Equestrian Federation President Chrystine Tauber and USEF Endurance Director Kristen Brett, were there to explain progress made in Region VII countries with regard to horse welfare. Despite setbacks in national, non-FEI competitions, overall there are major gains made with regard to horse welfare, lowing the number of vehicles and grooms on the course, and other requirements stipulated by the FEI. The AERC Board of Directors confirmed the continuation of AERC’s executive positions, with President Michael Campbell, Vice President Lisa Schneider, Treasurer Mollie Krumlaw-Smith and Secretary Susan Garlinghouse, DVM, re-elected to serve another term. With membership gains for the first time since the recession began, the conference is seeing a host of new and younger members taking to the trails for 25- to 100-mile AERC-sanctioned rides across the U.S. and Canada. More information on endurance riding is available by visiting www.aerc.org or by calling the AERC office at 866-271-2372. By request, the office will send out a free information packet to prospective members. Oreana, Idaho - A number of top Northwest endurance riders and horses are expected to vie for honors in the 11th annual Owyhee Tough Sucker Endurance Cup Race Ride, which will be run up the crick over the championship distance of 50 miles on April 2. The Idaho race ride is being held under the directives of veteran Owyhee ride managers Steph Teeter and Regina Rose. “Riders from southwestern Idaho, and possibly southern Idaho, central Idaho, eastern Idaho, southeastern Idaho, northern Idaho, in addition to maybe-if-we're-lucky some out of staters will battle for honors,” said Teeter, Director General of the Up The Cricksters Equestrian Club. 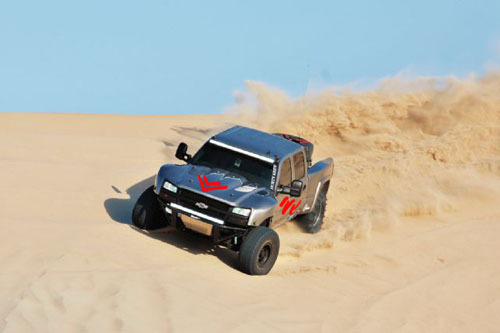 “For the first time ever, the winner of this glorious endurance race ride will walk away with a 4WD vehicle. And, what the heck, the rest of the Top Ten will get the same thing. “Apart from this, since the Tough Sucker races rides invariably turn out to be a bit chilly, a warm meal will be distributed to all those who participate in the 50 mile race ride. Those who participate in the 25 mile race ride will receive the same," Teeter added. Chief Information and Menu Advisor Admiral Rose commented, "We feel that someone needs to up the game of endurance in Owyhee County. 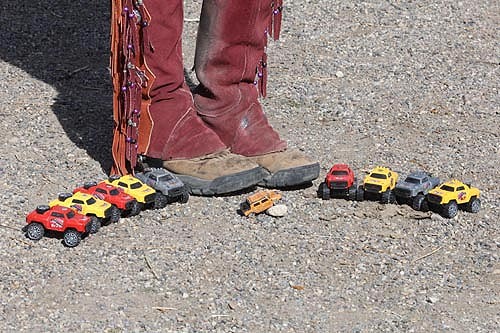 Who wouldn't want to be seen around the town of Oreana (population 8, maybe 9), in fact the 7,697 square miles of Owyhee County, in fact the entire country with a shiny new 4WD vehicle, won in an endurance race ride?" *Awards are as pictured right here. They are plastic. They are worth not more'n a dollar each. Get Tough, Suckers! Karen Bumgarner is hosting an introductory Endurance clinic in March. "I am again having the Endurance 101 Clinic out at my ride camp west of Homedale and south of Adrian. (southwest Idaho, Owyhee County) Last year was a half day and we really ran out of time and didn't get to talk about some things people were interested in. This year it's all day. Plus you can ride. Plus you can camp. But you don't have to do either, you don't even have to bring a horse but the options are there. Since we have all day we can be as basic or as advanced as you like. When you register - mark on your form any special requests. I need registrations by March 15 so I can plan but I have $20 Gift Certificates for early registrations. I only have a few left so please get them in to me. The price is $50. IF you want to ride with your own personal mentor, basically a private lesson, it's $25 to be paid to the mentor. But I have to know in advance to make that arrangement. Otherwise I point you down the marked trail and you ride it with your friends or on your won or whatever you choose. :)"
If riding is tour passion then perhaps you'd like to try Endurance Ridng! Once registered I’ll contact you with items that you will need and we’ll hope the weather is kind to us! You will need to bring horse water, weed free certified hay, your own food and snacks. We’ll also have potluck that night. So come prepared for a fun time and make new friends! Share goals and stories. Everyone will be given the DVD containing all the youtube presentations of AERC and Susan Garlinghouse DVM. Everything from ride camp to the finish line is covered. These you can watch in the comfort of your own home. The DVD will also feature book excerpts, ride flyers and more! * Setting goals - And a few other things by request. After the presentations part of the day we’ll take a break, have some lunch. And there will be a marked trail of 5-10-15 miles that you can ride. The fee will be $50 for the day. IF you want an experienced endurance rider to ride the loop with you and mentor then please make arrangements in advance and include $25 for their time and knowledge. Or you can just ride it with your friends at no extra charge. This will all take place south of Adrian, OR at or near the ride camp for the Owyhee River Endurance Ride. The date will be March 19, if we get rained out we’ll have to abandon ship. The discussions and visual can all be done at my house and small barn but I only have room for a couple trailers and the hope of riding the next day. First local ride of the season is April 2, 2016. Contact Karen Bumgarner; zap6000@gmail.com; 208-440-8413 to request an entry application before March 10th. The best ways a rider can reduce the risk of fatality is to be in tune with their horse, manage him properly through the ride, and voluntarily withdraw when their horse is not performing as expected, Schott said. “Endurance” is an aptly named riding discipline. The sport requires horse and rider to complete more than 50 to 100 miles of trail in a single day. Depending on the competition type, terrain, and climatic conditions, horses might be actively working anywhere from six to 24 hours. Because of the nature of the sport, dehydration, electrolyte imbalances, and heat stress can arise, sometimes leading to fatalities. Lexington, KY – (February 18, 2016) The Pyramid Society’s Performance Horse Award Program enrollment period for the 2015 competition year will close on March 1st, 2016. This innovative program is designed to support and promote the versatility of those Straight Egyptian and Egyptian Sired/Bred horses competing throughout North America in a wide range of performance disciplines. This year's program also offers complimentary enrollment with no Pyramid Society membership requirements. “We are pleased to provide this world-wide visibility for our talented Egyptian Arabian performance horses. Although representing a small percentage of bloodlines throughout the Arabian breed, Egyptian Arabians continually take home a high percentage of top awards in the show ring and in other competitive disciplines,” states Jaleen Hacklander, Chair of the Performance Horse Award Program Committee. Building on the great success of the 2014 program, the 2015 point system and awards have been expanded and divided into four competitive divisions including Pleasure, Working, Distance & Sport providing even more opportunities to WIN! Respective winners will be recognized through a special spotlight awards ceremony at the 2016 Egyptian Event and will receive custom awards, as well as visibility through international publications, and extensive online promotions. This program is made possible through the generosity of its Premier Sponsor: Markel Insurance, as well as Supporting Sponsors: Miars Arabians, Hadaya Arabians, Thornewood Farm, Kehilan Arabians, J&J Arabians and Cariswood Farm. For complete program information and guidelines visit www.RideEgyptians.com; call (859) 231-0771 or email Carol@PyramidSociety.org. The Pyramid Society is the world’s leading international membership organization dedicated to the Egyptian Arabian horse. Founded in 1969, it has maintained its mission to promote and advance these unique bloodlines through educational venues, local and regional activities, international representation and an active online community. The Society’s focus culminates each year at the Egyptian Event, the organization’s signature five-day breed showcase and competition held annually during the first week in June at The Kentucky Horse Park, Lexington, Kentucky USA. Congratulations to those who were granted these special awards and to all of those who reached goals worthy of mention during the 2015 season, and to all of those who simply rode and continued the tradition of Endurance Riding in the United States and Canada! MOSCOW, IDAHO— The Appaloosa Horse Club (ApHC) has partnered with the Arabian Horse Association (AHA) to host the very first multi-breed National Endurance Championship Rides. This exciting collaborative event will be held September 24, 2016. The ApHC looks forward to holding the eleventh Appaloosa National Championship Endurance Ride (ANCER) concurrently with the Arabian Horse Association Distance Nationals. This 50-mile ride is sanctioned by the American Endurance Ride Conference (AERC) and will begin at Frank’s Ranch, 430853 E 220 Rd, Vinita, OK. Registered Appaloosas that are also registered with AHA as half-Arabian may enter both National Championships. The ApHC is currently seeking sponsorships in support of this year’s ride. The event sponsorship form listing the many perks of sponsoring this year’s event is available at http://www.appaloosa.com/pdfs/2016AncerSponsorshipForm.pdf. For additional information and the 2016 official ride entry form, visit http://www.appaloosa.com/trail/national-champ.htm or contact the ApHC Trail & Distance Coordinator at (208) 882-5578 ext. 264. The Appaloosa Horse Club (ApHC) was established in 1938 with a mission of honoring the heritage and promoting the future of the Appaloosa horse. The ApHC has since registered more than 700,000 Appaloosas, which are known for their distinctive color, intelligence and even temperament. True to their reputation as an extremely versatile breed, Appaloosas can be found in nearly every discipline including racing, endurance riding and serving as reliable family horses. The international breed registry is headquartered in Moscow, Idaho, the heart of the Palouse region—the Appaloosa breed’s namesake and point of origin. MOUNT LAUREL – Honeymoons tend to be a joyous occasion when newlyweds escape to somewhere for some alone time and relaxation. However, one local couple has decided to forgo the typical vacation in pursuit of an adventure of a lifetime by traveling across the United States by riding on horse and donkey next month. "It was pretty much my idea," claimed Christian Muniz, a 25-year-old resident of Cinnaminson. "I came across an article on the American Discovery Trail and I said, 'that's what we should do for our actual honeymoon, like do a long distance trail or something.'" At first his wife Diedra, who is 27 years old, seemed to just brush off the idea since Muniz explained he tends to be the dreamer and she the realist. However, the couple married last spring and didn't take an actual honeymoon after their wedding, so making plans for an adventure led Diedra to begin researching the idea and it developed into a reality. And the idea to ride instead of hike stemmed from her love of horseback riding which she had begun teaching to her husband. "We've both been lifelong adventurers..." explained Christian. "And with this, we've both figured it was the best time to do it because afterwards we might not have an opportunity to do so..."
McNerney commented, "I would like to salute Bonnie Jenkins, our tireless executive director; Tucker Johnson, our dedicated president; and the generosity of Patti and Bruce Springsteen for a high energy, star spangled, Rockin' Rio Gala finish to the campaign that put us over the top! Equally important was the tireless effort of all the trustees and the energized donors who stepped up when our sport and country needed them!" 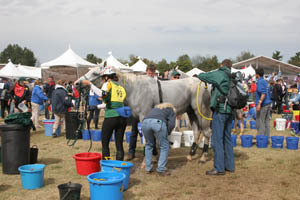 The money raised from the campaign has been used to fund High Performance programs in all eight international disciplines, as well as support for the United States Equestrian Teams at the 2010 World Equestrian Games, 2011 Pan American Games, 2012 Olympic and ParalympicGames, 2014 World Equestrian Games, 2015 Pan American Games and the upcoming 2016 Olympic and Paralympic Games. Fundraising "Challenges" established for specific disciplines were instrumental in increasing funding for para-dressage, eventing, dressage and reining, as well as providing for the establishment of the new Human Sport Science and Medicine program. High Performance programs through its use for training sessions, national championships and world championship and Olympic selection trials, as well as offices for the USEF's High Performance staff and the headquarters of the USET Foundation. The three main goals of the campaign were achieved; first, to increase the annual grant from the USET Foundation to the USEF for High Performance programs. In 2016 the largest grant of $3.5 million will be made, reflecting the strength of the campaign and being able to meet the needs of our teams as they prepare and participate in the Olympic and Paralympic Games this summer. The second goal was to grow the endowment, which increased by 86 percent, and the third was to expand the donor base at the Gold Medal level, which increased by 37 percent. For more than 50 years, equestrian athletes have represented the United States in international competition, bringing home medals that have clearly established the United States as among the world's equestrian elite. However, dedication, hard work and dreams alone do not bring home medals. The costs of fielding international teams are enormous. Training, coaching and transporting of human and equine athletes around the world in order to compete against the sport's best athletes is a daunting undertaking, requiring a huge commitment of time and money. The completion of the Campaign for Continuing Our Competitive Excellence will allow the U.S. to maintain this tradition of excellence and to remain competitive with the best in the world. First in my convention-note lineup is a talk given by Dr. Susan Garlinghouse. She is fairly well known in the endurance world for her articles on equine nutrition and other salient topics regarding the health and fitness of our horses. During this talk she essentially rounded up some of the more interesting things she had found from scientific research, and the practical applications of this recent research. Everything she talked about comes from her reading peer-reviewed research journals (so we don't have to?). There were several points that are very applicable to Deli and I. I hope making my notes available will be helpful for other riders and horse lovers. There are tons of factors go into growing a good foot – bio-mechanics, genetics, age, breed, metabolic rate, temperature, and moisture (so the season and climate in general matter quite a bit for what a foot needs). Nutrition is a big deal but there is no one thing that is a silver bullet. • Feed enough calories – the quality of their feed might not be high enough. In a positive energy balance they will grow foot 50% faster than horses on a restricted diet (not meaning the horse is on a “diet” for weight control, jut that the horse might be working more than the calorie intake received). • Provide a good amino acid profile – don’t just supplement one amino acid and expect it to make a difference (for example, don’t just add methionine). American Trail Gear, Ann Kratochvil, Arabian Horse Association, Arabian Saddle Company, AthleticEquine.com, Auburn Laboratories, Inc., Blue Pegasos USA, Boz Saddlery/Bozzage Training, Designs by Lin, EasyCare Inc., Farmers Warehouse/LMF Feeds, Ghost Saddles - USA, Hawthorne Products, Hooves N Whiskers Tack, Hough Endurance Tack, Pro Earth Animal Health, Purina Animal Nutrition, Reactor Panel Saddle Company, Renegade Hoof Boots, RevitaVet Therapy Systems, Sage Brushes Studio, Specialized Saddles/Brenda Benkley, Star Milling, Starfire Design Studio, The Distance Depot, Trailwise Saddles, Triple Crown Nutrition, UndeRider, Vettec, Inc., Western States Trail Foundation, XP Rides, Young Living/Solution Sales. PLUS: AERC Authors, Rose Parade Riders, Deanna Guinasso (rider fitness info), AERC Photographers, NATRC, 2016 AERC National Championships. Pastor Len Crow seldom rides for pleasure anymore, but he does ride for purpose. This month, he will saddle up in support of widows and orphans of late Israeli soldiers. "Tonight, there will be kids going to bed without a dad," Crow said. "And when the principal bread earner, the mom, is trying to put food on the table and pay the bills, things become very hard. So, we're hoping to help in a small way and do what we can do." This will be Crow's seventh fundraising ride since 1996. He will leave for Israel Feb. 16, with the ride starting Feb. 19 and expected to end four or five days later.